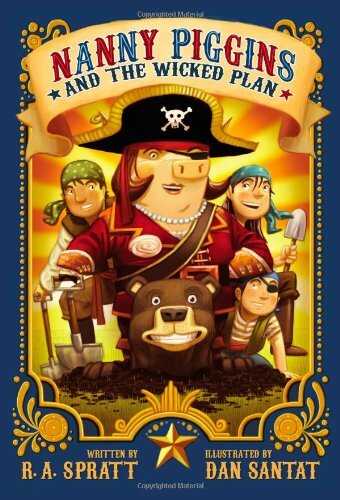 The world’s most unusual nanny pig is back in this side-splitting sequel to The Adventures of Nanny Piggins! When Mr. Green announces his diabolical plan to get married, his children Derrick, Samantha, and Michael, are horrified. If he marries, he’ll fire their beloved Nanny Piggins, and they will have a mother who will not spoil or corrupt them. Breakfast without chocolate? No picking locks to get into places? Someone must stop him, and Nanny Piggins is just the pig to do it! Coming up with a wicked plan of their own, Nanny Piggins and her adopted brother bear Boris do their best—or is it their worst?—to prevent such an event from happening. R. A. Spratt’s deliciously funny follow-up to her award-winning debut is packed with surprising adventures for the feisty Nanny Piggins and the adorable Green children. From being blasted out of a cannon with an arrogant armadillo to dueling with a Gypsy Queen over a pit of fire to save Mr. Green from his own demise. Nanny Piggins’ good intentions and absolutely politically incorrect methods will entertain and delight readers of various age groups.